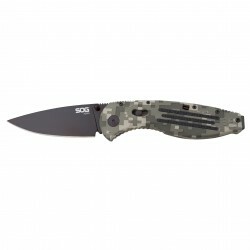 "The SOG Trident uses the S.A.T. (SOG Assisted Technology). Now using the patent pending Arc-Actuator the Trident locks stronger and releases easier. There is also a built-in safety to lock the blade closed. When it shows red you are ready to go. What also makes the Trident so unique is the patent pending Groove in the handle which allows the operator to cut paracord fishing line etc. without having to open the blade. The handle also includes a Digi-Grip variable pattern for coarser grip in areas that require it. The bayonet style clip is easily switched for right/left hand carry or removed for pouch storage.